Apple has updated the App Store within iTunes to allow you to share information about an app through a standard Web browser. This certainly makes it easier for reviewers and even enthusiasts to pass along pointers to interesting apps (see previous post). When viewing information about a specific app within iTunes, just click on the menu under the application's icon in the top left corner of the screen, and select Copy Link. Then you can e-mail the link, or paste the URL directly into a browser, to view the app information directly over the web -- without needing to run iTunes. For example, I can now link directly to the Photoshop Mobile app (see previous post). The app's web page shows the same description, screen shots, and reviews that you see within iTunes itself -- and links back to iTunes to download the app. Unfortunately, you still can't search for apps directly from the web, and while you can link to see related applications, other information like the developer link redirects back to iTunes. This is an extension of the iTunes Preview feature that Apple apparently introduced last fall, which adds the Copy Link option in the menu for music and videos in the Buy Now menu under the product image. See, for example, A Colbert Christmas. It's also time to upgrade iTunes, as Apple has released iTunes 9.0.3, with "a number of important bug fixes." 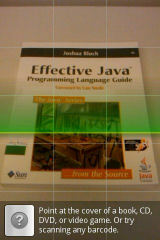 See my Smartphone Apps Gallery for more on apps and app stores. Is there really a need for all these smartphone apps for current information, like news, sports, finance, and weather? After all these are plenty of websites that will provide this kind of info, and even let you configure customized listings. Yet there are entire categories in the iPhone App Store and Android Market dedicated to each of these! Well, actually, while web browsers are great for, well, browsing though a variety of sites, a dedicated app can provide a much better experience on a smartphone -- with the information formatted to fit the screen without clumsy zooming or scrolling, and one-tap access to further information though finger-sized controls and tabs. Plus, you can store and customize your personal information more conveniently. Even an apparently straightforward app like The Weather Channel (see iTunes preview) can provide an impressive range of useful features, albeit not all the same across all the supported platforms (it's free for the iPhone, Android, Palm, BlackBerry, Windows Mobile, and BREW & Java). Besides local forecasts and conditions (customized to your list of locations), the Weather app also displays a map view with animated radar / satellite and other customized overlays. Or you can watch local, national and international video forecasts, as on TV. Even better, the app can run in the background on Android, checking for weather alerts, and then warn you of impending issues using the Notifications area across the top of the screen (the red circle with the exclamation mark). 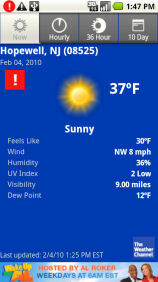 Just pull down and tap to launch the app and display the text of the alert from the National Weather Service. As a result, the weather alerts can be treated in a standard way, like other notifications like alarms or incoming text messages -- and without interrupting your work in progress, so you can then review and choose how to respond to them when you're ready. Yes, Android already does support multi-touch on phones like the Verizon / Motorola Droid, but for some reason this feature was not enabled in applications even in the Android 2.0 release -- although some individual third-party apps like the Dolphin Browser do use it. It seems the omission is changing. Microsoft has lowered the price for its Zune HD media players (see previous post). The Zune HD 16 GB model has dropped to $199 (was $219), and the 32 GB model to $269 (was $289) on the Microsoft site -- with street prices more like $189 and $249, respectively. These compare to the Apple iPod touch at 8 GB for $199, 32 GB for $299, and 64 GB for $399. The Zune HD features a bright 3.3 in. OLED display with multi-touch navigation (pinching), and quite useful Web browsing over Wi-Fi, with extras including digital HD Radio and playback of HD videos using a dock adapter (see previous post). The Google Android platform is focused on smartphones as cloud devices, integrating with online services like Gmail and Google Contacts and Calendar. But it also integrates with the cloud at a deeper level, with Google back-end services like voice input (speech recognition), voice output (text to speech), and translation. As a result, Android developers can build on these services to integrate these kinds of rather sophisticated features into their own applications. And the integration can be deeper -- in the latest Android for the new Google Nexus One phone, all text input fields now accept voice input. Since smartphones are strongly connected devices with wireless broadband services, they are no longer constrained by whatever performance and functionality might be reasonable to expect from handheld processors and storage. 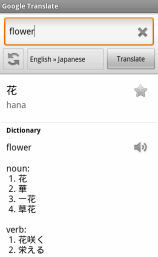 For example, the free Google Translate app for Android brings the full functionality of the Google Translate online service into your hand, with over 50 languages currently supported. 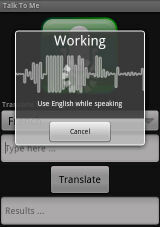 And, of course, it supports voice input (to speak the phrase to be translated -- in English only, for now). And it provides text to speech output for the translated text in the target language. It also remembers the recent history of your phrases, and you can star specific items for later recall (even if the phone is offline). As another example, Talk To Me, another free app for Android, provides several convenience options around this same set of services. To help communicate with others, Talk To Me has a simple mode for quick voice translations from English to common languages -- just speak, and then listen to the translation (which is also displayed as text so it's easy to show). The app also has options to slow down the speech rate and pitch to help make it more intelligible. Even simpler, you can create a Widget on the Android desktop for instant translations. And you can send the translated text in E-mail or as a text message. Not bad for what are basically simple dialog boxes to select the languages and listen to the translation -- with the heavy lifting done in the cloud. In this way, handheld apps are breaking free of the apparent limitations of the small platform, and are going to get a lot more sophisticated. 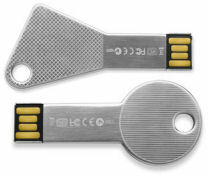 The LaCie line of USB drives designed as metal keys has expanded further with the new WhizKey (triangular) and CooKey (rounded), available with up to 32 GB of storage for $99. These join the previous imaKey and itsaKey designs (see previous post) -- packaging portable storage in a rugged, flat, and thin design that is easy to carry on a key ring. These are actually half the thickness of a USB port, with a gold SIP connector with protective edges, and water- and scratch-resistant. In addition to the built-in flash memory, these keys also add 4 GB of online storage for 2 years using the Wuala technology (now owned by LaCie -- see previous post). And new LaCie hard drives include 10 GB of online storage. Wuala encrypts your files, splits them into fragments, and then stores them redundantly on servers and in its grid network of users. This combination of physical and cloud storage was a developing trend at the recent Consumer Electronics Show (see previous post). In the home, set-top boxes (like Blu-ray players) are expanding into home media servers that also deliver Internet TV, and external disk drives have become home networked attached storage (NAS) units that are also remotely accessible over the Internet. Meanwhile, cloud services now offer to outsource all your storage away from physical boxes to online for easier access, sharing, and backup. And on mobile devices, growing local processing power and expanding storage capacity is becoming less important as cloud services bring full-strength online functionality like language translation into your hand (see previous post). As with these new LaCie USB keys, there's a good argument for combining the best of both -- having physical possession of your data plus online backup for remote backup and sharing. Windows Phone 7 Series - Beyond Apps to "Hubs"
Microsoft has previewed the next generation of its Windows Phone platform at the Mobile World Congress. Dubbed Windows Phone 7 Series, the first products are due for the holiday season at the end of 2010. Windows Phone 7 is a significant change for the former Windows Mobile platform (see previous post). It combines a Zune-like smooth-flowing user interface, the Zune music and video experience, and Xbox LIVE games and service. And it tightens the platform requirements, including requiring a touch screen. But the biggest news is Microsoft's push to move beyond individual apps, to make your phone the "hub" of data and information, especially updated from online sites -- using "live tiles" on Start screen. - Like the Apple iPhone, it's now a full-fledged media player, albeit designed to work like the Zune HD (see previous post) and to sync with the Zune PC software. - Like Android phones, all Windows Phone 7 devices now will have dedicated hardware buttons for Back, Start (the Windows button), and Search (although there's no Menu button -- instead there's an app options bar / bar at the bottom of the screen). The design finally abandons the Windows Mobile phone buttons for Start and End Call, and updates the Zune design which had only one button for Home. - Like Palm OS, Windows Phone 7 provides integrated views of information from the different aspects of your life -- personal and business, local and online, and social networking sites -- to view all your photos or contacts or calendar entries together, even though they come from multiple sources. - Like Android, Windows Phone 7 lets you organize and customize your home screen, not just with favorite apps and contacts and links, but with dynamic "live tiles" (i.e., widgets) that display live feeds from applications and Web services. But the deeper change in Windows Phone 7 is the move away from individual apps to more integrated "hubs" that provide common access across multiple sources. The tiles on the Start screen are doorways to these hubs, including People, Pictures, Games, Music + Video, Marketplace, and Office. For example, for communicating with people, on Android you need to run different applications for Messaging vs. Gmail vs. other Email, plus separately check for friend updates on a various social networking sites by downloading individual associated apps. But on Windows Phone 7, the People hub integrates contacts and social network updates in one view -- and you also can post your own updates to these sites. Similarly, the Pictures hub presents combined albums for your local and PC and online photos, plus updated photos from your friends online. And all these use the Zune interface approach, with automatic organization including Recently viewed items and What's New updates. The open question, then, is how this more controlled and tightly integrated platform can still allow phone manufacturers and cellular carriers to customize and distinguish their offerings, and allow software developers to create innovative apps. At the announcement, Microsoft insisted that there was still room for customization and innovation, for example though extensions to the hubs in lieu of separate apps. But this was still an early announcement of plans for products that are due out around the end of the year, so there are more details to come. More portable devices are using USB chargers and cables, which simplifies the hassle of tracking and packing power adapters when you're on the go. You can get far, for example, with a USB-to-iPod cable for your Apple devices, plus a USB-to-microUSB cable for a wide variety of devices, from Bluetooth headsets to mobile phones and smartphones. You then can charge your devices from the USB port on your laptop, or plug in a USB wall adapter. Even better, you can use the iGo Charge Anywhere -- a USB wall charger for $49 that also has an integrated battery to charge when you're away from a power outlet. As a bonus, it also has two USB outlets, so you can charge two devices at once, whether plugged in or unplugged on the go. The Charge Anywhere should work with most of your portable gear, including Bluetooth headsets, mobile phones, media players, portable gaming devices, digital cameras, and GPS devices. It also includes a USB adapter to connect to the wide variety of iGo tips for specific devices. The Charge Anywhere is well designed, with a folding power plug for compact travel, and a power button to turn on the USB charging ports. And it's relatively small and light, at around 3 1/2 x 2 x 3/4 inches, yet iGo reports that it provides up to three full charges for most mobile devices. 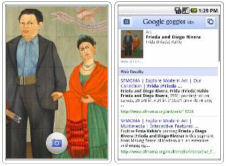 What's all this about "augmented reality" for mobile apps? Well, Virtual Reality (VR) has to do with being immersed in a synthetic 3D graphics environment, i.e., experienced in a head-mounted display -- whether for action games, or for serious research like exploring the virtual surface of Mars or experiencing chemical bonds at molecular scales. Then Augmented Reality (AR) combines graphics overlays on top of (i.e., augmenting) the real world, as in a heads-up display or the familiar yellow first down line for football games. On a smartphone, the device already can display location-based information about near-by businesses and points of interest. And it has a camera that can display live video on the display. So combine these and you get AR -- hold up the phone and look around to see the local scene as live video, with text and graphics overlays identifying items in that direction. 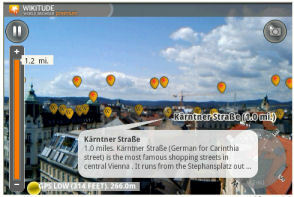 This idea is already implemented in mobile apps including Google Goggles (for Android) and Yelp (iPhone 3GS only). Or try Wikitude (shown here), which adds geo-tagged user-created content including Flickr photos, YouTube videos, and Wikipedia info (iPhone, Android, Symbian), and Layar, which imports user-created or partner content "layers" for customized tours of local areas (iPhone, Android). However, these apps still are limited by the handheld mobile platform. It's awkward to hold up a device and look around with it, especially when the small screen can only show a rather limited field of view within the surrounding scene. In addition, the inexpensive sensors in handheld devices can have significant errors. As a result, current mobile AR apps cannot precisely register information to the background scene, and instead typically indicate objects of interest in a general direction, and show their relative positioning. So augmented reality is just beginning on smartphones. Still, these devices are good enough to do real-time GPS navigation, for example, and support AR-style apps that display information about upcoming traffic cameras, or help you retrace your route to where you parked your car. Maybe it's time to put on wireless eyewear to go with our Bluetooth headsets. Are you tapping into mobile apps? I'm back at the Princeton University IT Seminar series at noon on Wednesday, February 24 for a talk on Mobile Smartphone Apps, especially location-based applications and cloud services. I'll have live phones to demo, including Apple, Google Android, Palm webOS, and Windows Phone. UPDATE: See the talk summary on the Princeton Univ. IT’s Academic blog, and you can download the podcast from the Princeton site (MP3). Cameras are for more than taking pictures, and smartphones are more than communications devices. Combine the two, and you have a handheld device that can "look" at objects and tell you about them. For example, the Shop Savvy app (free for iPhone, Android, and Nokia) and similar apps can scan a barcode and return information about that product, with web links and reviews. But why require barcodes? The new Google Shopper app for Android offers three forms of product search: plain old text search, voice search (say the product name), and image search. With image search, Shopper continuously scans the image from the camera, looking for a recognizable product -- not only barcodes, but also cover art from books, CDs, DVDs, and video games. In seconds, it identifies the object and returns information including prices, reviews, detailed specs, and links to sellers. You also can save history and favorites to access even if the phone is offline. And Shopper does not even need to see the entire cover -- I was able to use it to quickly recognize books from just the top of the cover, and CDs from just the artist's face. Shopper packages the product search features demonstrated in the earlier Google Goggles app (also free for Android), which does more general visual search. It identifies products, also including wine labels, as well as generally recognizable objects including landmark structures (buildings and bridges) and famous artworks. Plus, Goggles does text recognition for business cards to extract contact information, and Google has demonstrated a new version that does more general text recognition and transition, for example for highway signs. While Shopper just constantly looks for something recognizable, Goggles waits until you take a picture to start the search. These are amazing -- and useful -- apps, harnessing the Google image search and product search engines and databases in the cloud to turn your phone into an almost real-time recognizer. And this is just the beginning -- Google is not terribly specific about exactly what kind of stuff these apps recognize. For example, it turns out that Goggles also does general image search to find matching images on the web, whether or not they are further identified as known products, landmarks, or artworks. Still or motion? Camera or camcorder? Technology is converging -- as even consumer digital cameras shoot HD video, and video camcorders shoot multi-megapixel photos. And the trend has continued into professional Digital SLR cameras, which have evolved to add the ability to shoot HD video, starting with the Nikon D90 (see previous post). Sometimes called a "Video" or "HD" or "Hybrid" DSLR, this idea was originally conceived as a way to help photojournalists expand their repertoire, and has grown quickly to become attractive to videographers as well. With a video DSLR, you can carry one camera for shooting both photos and video, and shoot video unobtrusively and in difficult environments. The big bonus, however, is the glass -- the ability to use the extensive collection of photographic lenses available for DSLR cameras, giving you amazing flexibility in controlling the focal length and depth of field. Combined with high ISO ranges from image sensors much larger than typical camcorders, the result is great flexibility in shooting in low light situations. However, these cameras are still primarily designed for still photography, and not for studio or event use, so they typically don't have features like built-in stereo microphones, and they typically shoot only short clips, around five to ten minutes. In addition, the video modes do not provide the full capabilities of the traditional photographic modes, with limited manual control and/or limited auto focus or exposure options. But over the past year, companies including Canon, Panasonic, and Nikon have responded to growing interest in video DSLRs by introducing a range of products, from enthusiast models around $900, to more rugged workhorse models for pros like journalists and wedding photographers around $2000, to high-end models around $5000. Especially for photographers, stepping up to a HD DSLR can expand your repertoire, so you can shoot video and audio with familiar equipment, instead of having to lug around additional gear. See my full article in Videomaker magazine, HD Video DSLRs - A Different Kind of Camcorder, with the experiences of professional photographers and videographers who have begun using HD DSLR cameras. 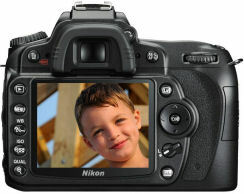 See my Digital Cameras Gallery for more on DSLRs, the D90 and other cameras. Entries posted to Manifest Tech Blog in February 2010, listed from oldest to newest.